Home » Antibody Production Services » Custom Monoclonal Antibody Development » MonoRab™ IHC Application Service New! Generating monoclonal antibodies (mAb's) in rabbits using MonoRab™ technology can significantly improve immunoreactivity, sensitivity, and specificity of any antibody. Unlike rodents, the affinity of MonoRab™ antibodies can reach picomolar level, whereas murine antibodies are typically around the nanomolar level, allowing for higher working dilutions and strong antigen-antibody binding. MonoRab™ can also generate high quality mAb's against difficult antigens, such as small molecules, transmembrane proteins, and highly similar antigens. MonoRab™ antibodies have high specificity and high diversity, allowing mAbs to yield excellent results in Immunohistochemistry (IHC), Immunofluorescence (IF) and Immunocytochemistry (ICC) applications with limited cross reactivity of non-specific targets. Have GenScript Custom Antibodies Generated Quality Data in Your Experiments? OR Are You Looking for a New Provider of Highly Specific Custom Antibodies? Ask Your Account Manager Today! Low Background: Less cross reaction with non-targets. Ideal for Novel Epitope Recognition: Single or wide epitope identification. High Sensitivity: No loss of specificity. High Affinity: Clean results with stringency. Ideal for Mouse Preclinical Studies: No tissue cross reactivity. Post-translational Modifications: small epitopes or single aa substitutions can be visualized. 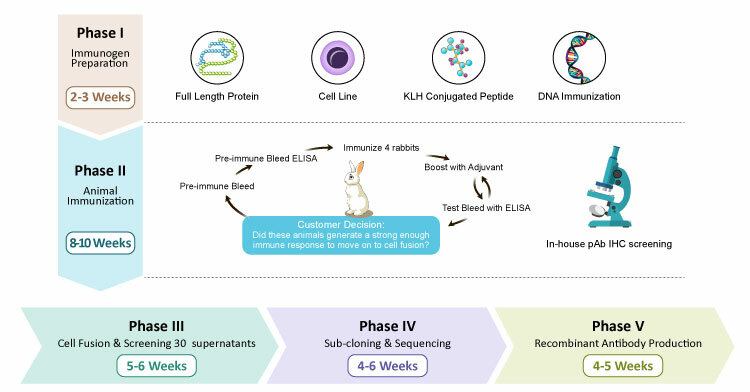 Phase I: The process of generating a MonoRab™ custom rabbit mAb begins by immunizing rabbits with the desired immunogen, which can be a peptide, protein, DNA, Cell line or corresponding to the intended antigen. GenScript can also recombinantly generate the antigen if the client does not have it already purified. Phase II: The immunized rabbits will go through multiple rounds of additional immunogen boosts, test bleeds, and ELISA screenings until the serum is positive for a high titer. Once the serum is positive for a high antibody titer, polyclonal antibodies will be purified and used for in house IHC validation on client chosen tissue. Based on pAb IHC staining and signal intensity, the fusion can be performed, otherwise we give additional boosts to get satisfactory pAb IHC data. Phase III: After immunization and screening, individual B-cells are isolated from 3 rabbits and electro-fused to mouse myeloma cells to generate hybridoma cells. Three hybridomas are then subcloned and screened for positive monoclones. The supernatants of these monoclones are used in ELISA screenings as well as customer analysis. Phase IV: After the selection of a specific clone for mAb generation, the B-cell is subjected to antibody variable region sequencing. Deliverables: Ab sequencing report (≤10), 5 ml final supernatant/ positive clone (≤10), and COA report. At least 1 mg purified Ab for each clone. Images from pAb IHC will be delivered before cell fusion. Depicted here is a simple schematic showing the process of IHC. First, a tissue is incubated with a primary antibody, known to bind a specific antigen. Then, a secondary antibody is used to bind to the primary antibody in order to enhance the final signal. Third, an additional antibody is added which binds to the secondary antibody and contains a visualization probe, such as horseradish peroxidase. Finally, the visualization probe is activated in order to see exactly the amount of, and where a specific antigen is located. Phase II: The immunized rabbits will go through multiple rounds of additional immunogen boosts, test bleeds, and ELISA screenings until the serum is positive for a high titer. Serum purified and the pAb tested for IHC application at GenScript on rodent tissue, human tissue or client desired tissue type. Based on pAb IHC staining and signal intensity, the fusion can be performed, otherwise we give additional boosts to get satisfactory pAb IHC data. Phase V: Variable region sequencing data is used for recombinant expression and purification of the desired mAb. GenScript performs polyclonal antibody IHC/IF testing prior to cell fusion and hybridoma development, to make sure the monoclonal supernatants have potential binders to have successful IHC/IF.. Figure 1. Comparison of Rabbit and Mouse Anti-β Actin mAb's in monkey liver. GenScript generated mouse anti-beta actin mAb was visualized via anti-mouse 568 (A) and directly compared with GenScript generated rabbit anti-beta actin visualized with anti-rabbit FITC (B). The resulting co-localization image (C) revealed significantly more binding of rabbit anti-beta actin than mouse, as highlighted by the white arrows. Figure 2. Comparison of Rabbit and Mouse anti-β Actin mAb's in monkey lung. GenScript generated mouse anti-beta actin mAb was visualized via anti-mouse 568 (A) and directly compared with GenScript generated rabbit anti-β actin visualized with anti-rabbit FITC (B). The resulting co-localization image (C) revealed significantly more binding of rabbit anti-beta actin than mouse, as highlighted by the white arrows, indicating that the rabbit anti-β actin mAb has a much higher affinity than its mouse generated counterpart. Figure 3. Comparison of GenScript Rabbit Anti-Beta Actin mAb with Competitors in monkey cardiac muscle. GenScript generated rabbit anti-beta actin mAb (A) was compared with competitor generated rabbit anti-beta actin mAb (B&C) via Nova-red visualization. The resulting images reveled that compared with competitor B, GenScript rabbit mAb showed significantly higher sensitivity as shown by the blue arrows. Compared with competitor C, Genscript's rabbit mAb showed higher specificity, as competitor C's mAb bound to other forms of actin present within the cardiac tissue, as shown via the yellow arrows. Figure 4. GenScript generated rabbit isotype control (A) have no back ground or non-specific binding to the tissue and GenScript Rabbit Anti-Beta Actin mAb with in monkey cardiac muscle tissue shown in B.